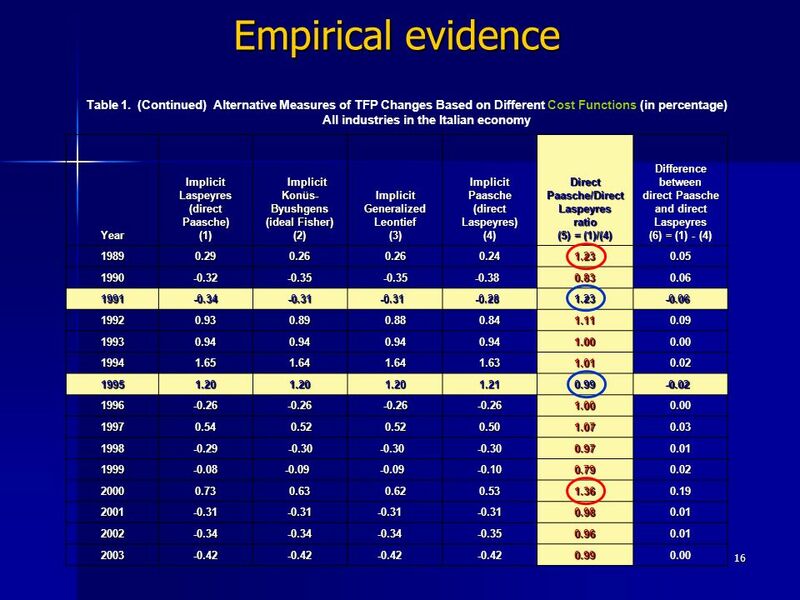 1 Alternative Measures of Productivity in a Changing Structure of Production by Carlo Milana Istituto di Studi e Analisi Economica, Rome, Italy This presentation. 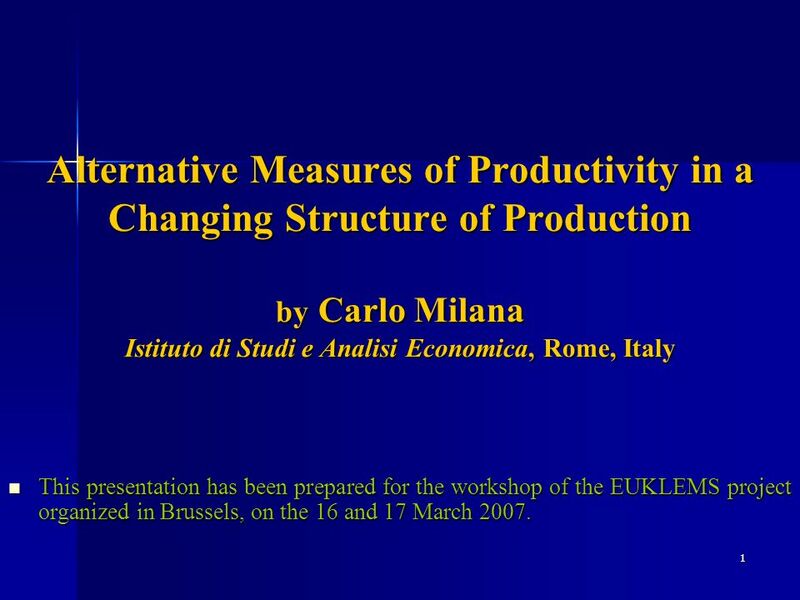 1 1 Alternative Measures of Productivity in a Changing Structure of Production by Carlo Milana Istituto di Studi e Analisi Economica, Rome, Italy This presentation has been prepared for the workshop of the EUKLEMS project organized in Brussels, on the 16 and 17 March 2007. This presentation has been prepared for the workshop of the EUKLEMS project organized in Brussels, on the 16 and 17 March 2007. 3 3 Special reference will be made to Afriats theory of economic index numbers Afriat, S.N. (1956), Theory of Economic Index Numbers, Research Report, Department of Applied Economics, University of Cambridge, UK. ____ (1967), The Construction of a Utility Function from Expenditure Data, International Economic Review 8(1): 67-71. ____ (1972), The Theory of International Comparisons of Real Income and Prices, in D.J. Daly (ed.by), International Comparisons of Prices and Output, NBER, Studies in Income and Wealth Volume 37, New York, 1972, Ch. 1, pp. 13-84. ____ (1977), The Price Index, Cambridge, UK, Cambridge University Press. ____ (1981), On the Constructability of Consistent Price Indices Between Several Periods, in A. Deaton (ed. by), Essays in the Theory and Measurement of Consumer Behaviour. Cambridge University Press, pp. 133- 61. 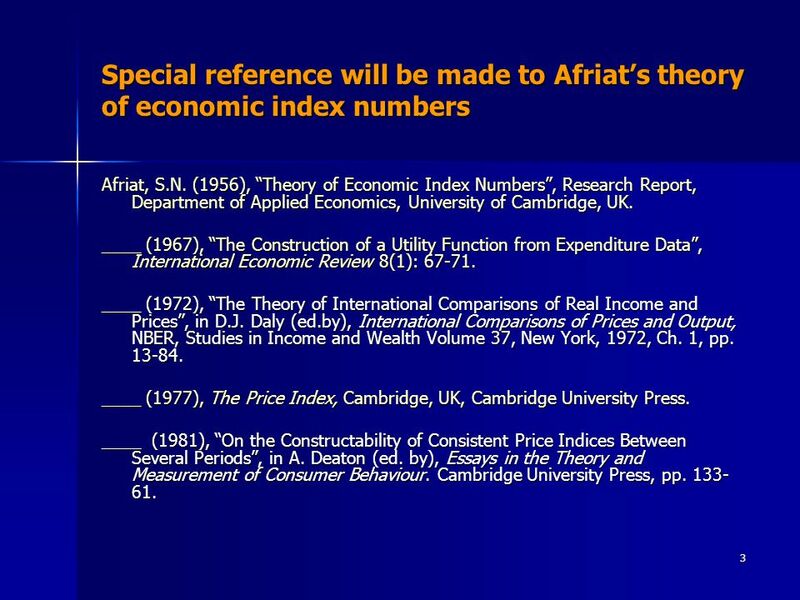 4 4 References to recent contributions Sydney N. Afriat (2005), The Price Index and Its ExtensionsA Chapter in Economic Measurement, Forward by Angus Deaton, London and New York, Routledge. 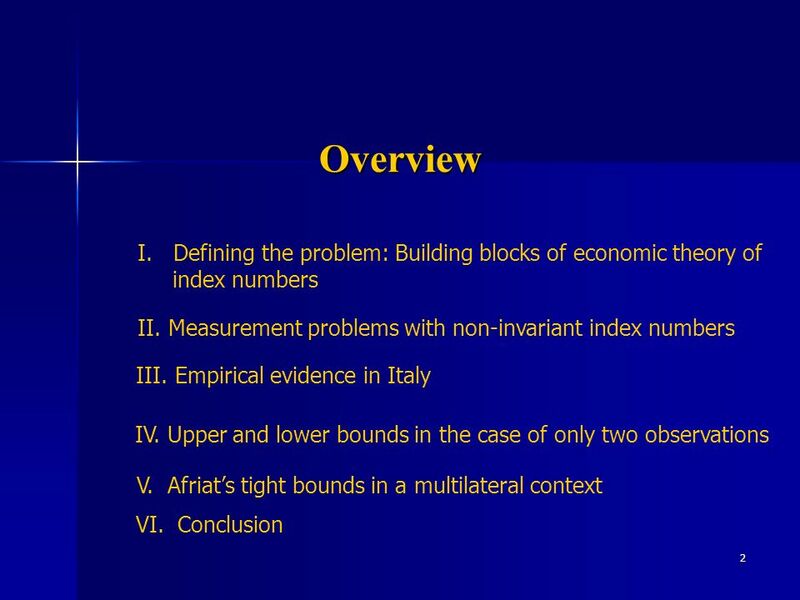 Carlo Milana (2005), The Theory of Exact and Superlative Index Numbers Revisited, EUKLEMS Working Paper no. 3. Afriat, S.N. 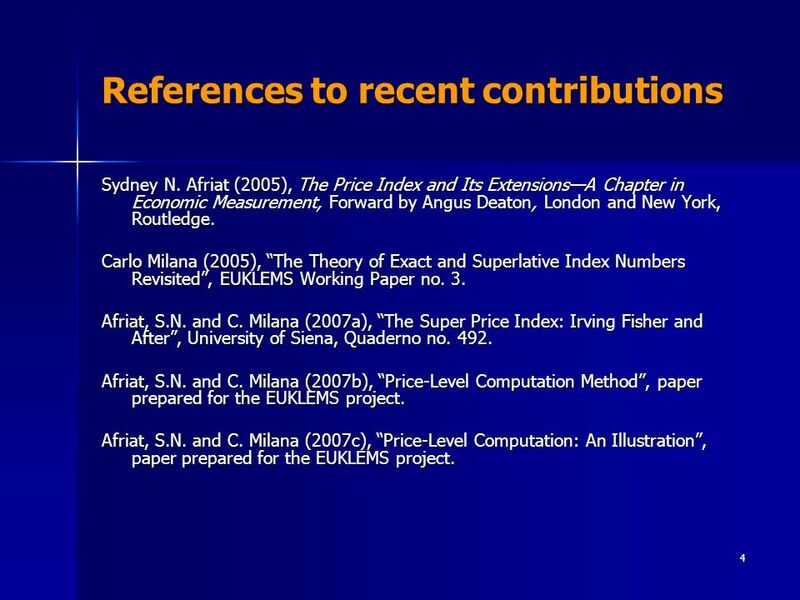 and C. Milana (2007a), The Super Price Index: Irving Fisher and After, University of Siena, Quaderno no. 492. Afriat, S.N. and C. Milana (2007b), Price-Level Computation Method, paper prepared for the EUKLEMS project. Afriat, S.N. and C. Milana (2007c), Price-Level Computation: An Illustration, paper prepared for the EUKLEMS project. 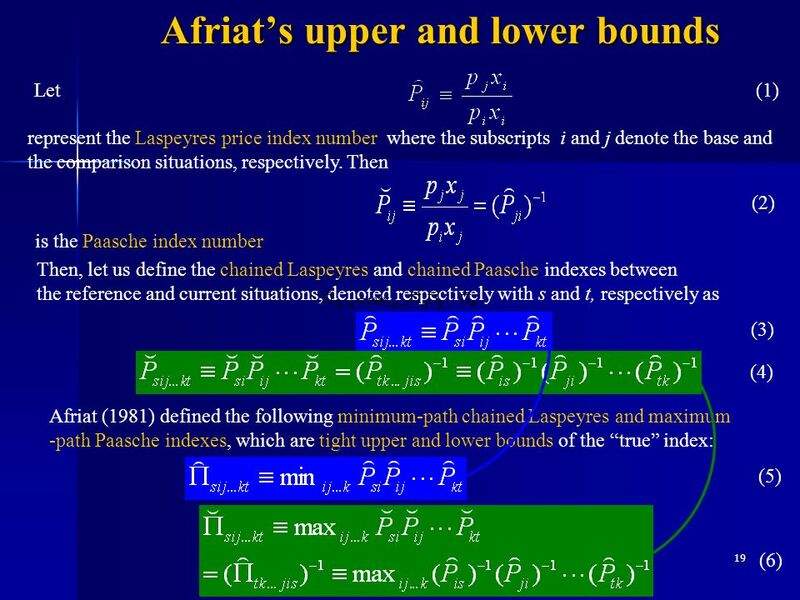 5 5 Building blocks of economic index numbers (1) The factorization theorem and the invariance (existence) of aggregating index number: Shephard (1953) in the economic theory of production and Afriat (1956)(1972) in the economic theory of consumption. The notion of exact index numbers: Byushgens (1925), Konüs- Byushgens (1926), Samuelson (1947)(1984). 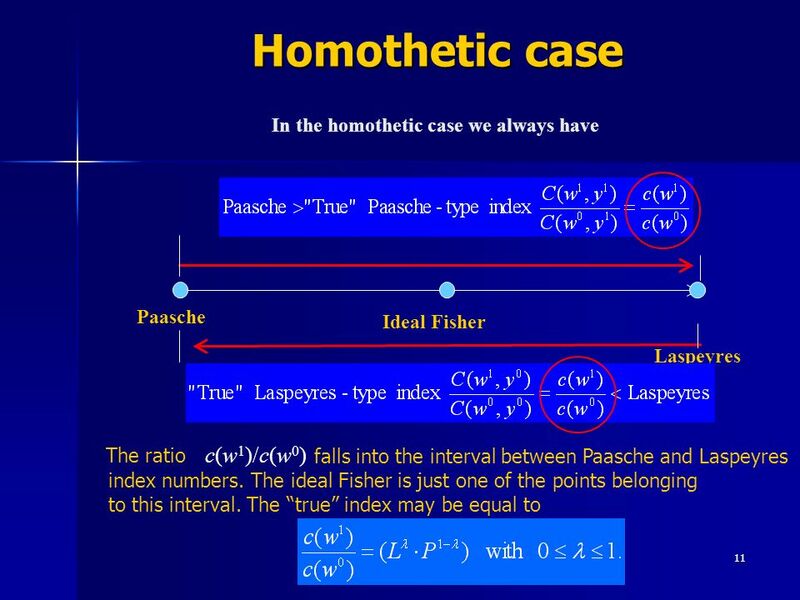 The index number problem: the impossibility theorem on Fishers (1922)-Frisch (1930) test criteria: (i) linear homogeneity; (ii) time- reversal test; (iii) circularity or transitivity test; (iv) dimensional test; (v) (weak) factor reversal test: Samuelson (1974), Samuelson and Swamy (1974, pp. 571-575). 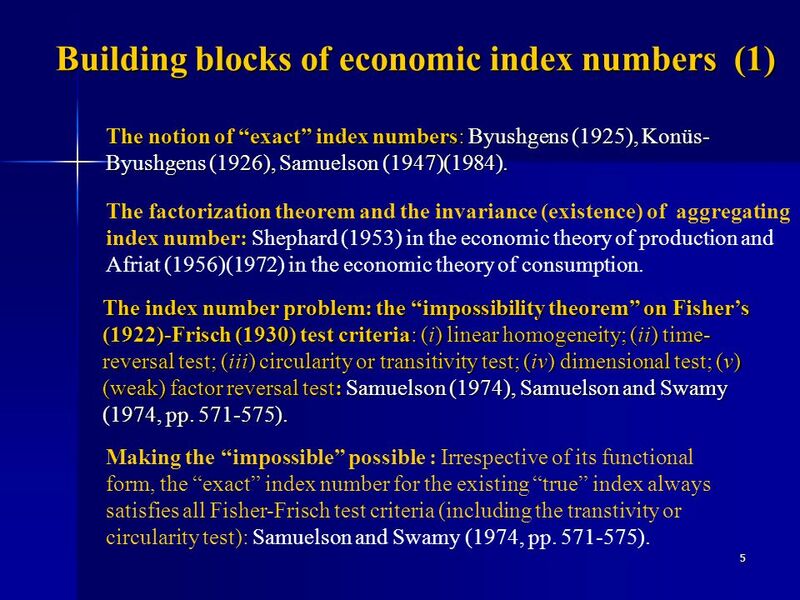 Making the impossible possible : Irrespective of its functional form, the exact index number for the existing true index always satisfies all Fisher-Frisch test criteria (including the transtivity or circularity test): Samuelson and Swamy (1974, pp. 571-575). 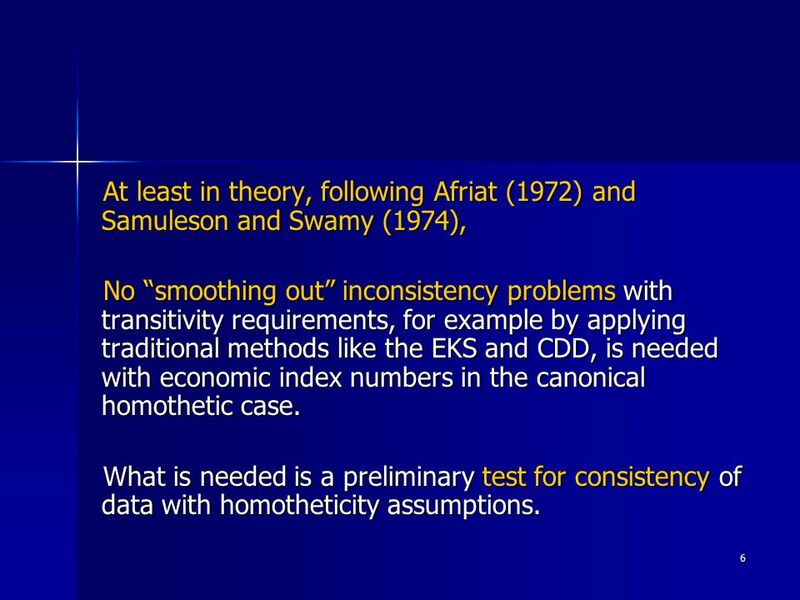 6 6 At least in theory, following Afriat (1972) and Samuleson and Swamy (1974), No smoothing out inconsistency problems with transitivity requirements, for example by applying traditional methods like the EKS and CDD, is needed with economic index numbers in the canonical homothetic case. What is needed is a preliminary test for consistency of data with homotheticity assumptions. 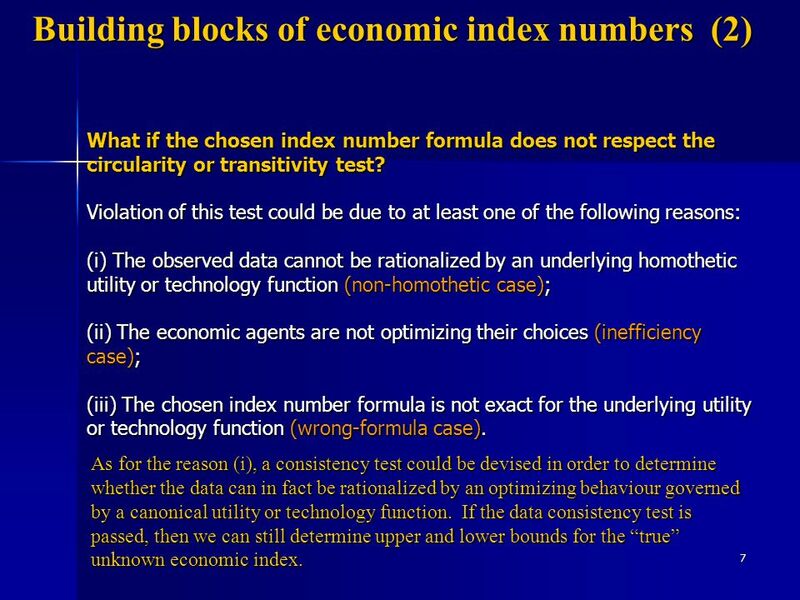 7 7 Building blocks of economic index numbers (2) What if the chosen index number formula does not respect the circularity or transitivity test? Violation of this test could be due to at least one of the following reasons: (i) The observed data cannot be rationalized by an underlying homothetic utility or technology function (non-homothetic case); (ii) The economic agents are not optimizing their choices (inefficiency case); (iii) The chosen index number formula is not exact for the underlying utility or technology function (wrong-formula case). As for the reason (i), a consistency test could be devised in order to determine whether the data can in fact be rationalized by an optimizing behaviour governed by a canonical utility or technology function. 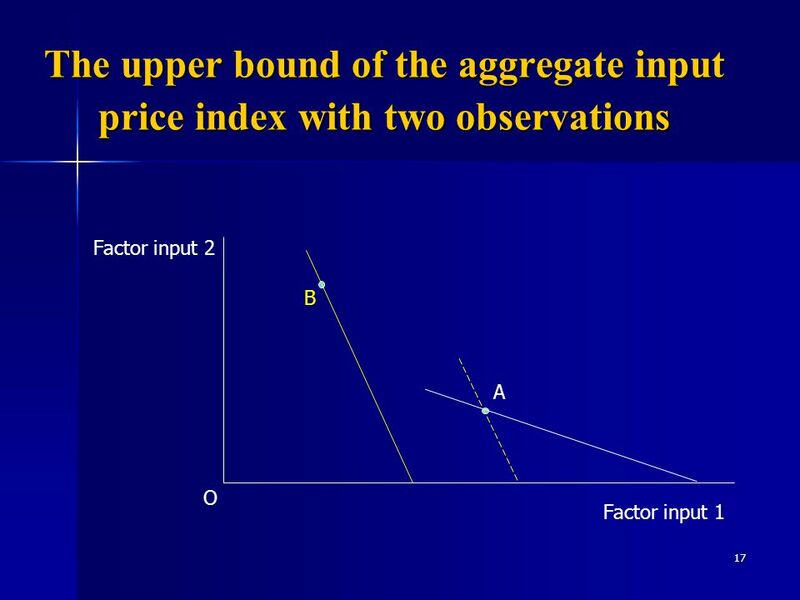 If the data consistency test is passed, then we can still determine upper and lower bounds for the true unknown economic index. 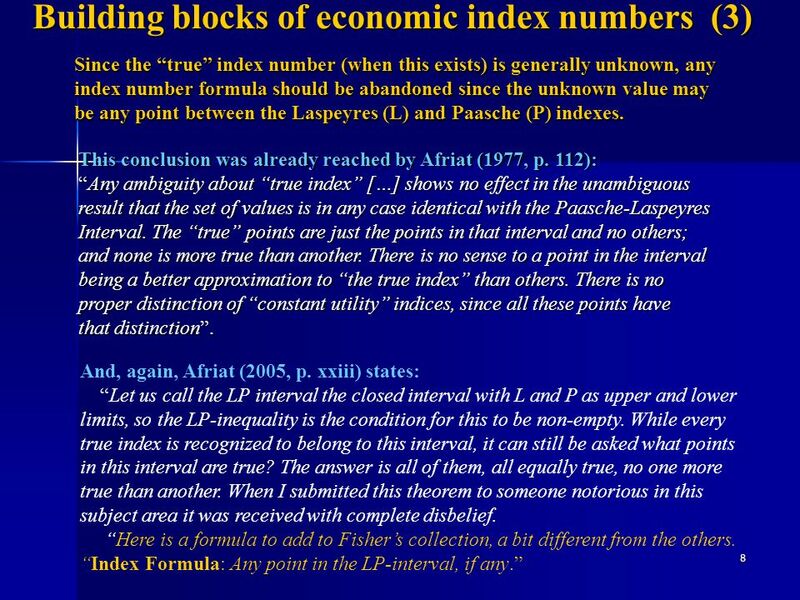 8 8 Building blocks of economic index numbers (3) Since the true index number (when this exists) is generally unknown, any index number formula should be abandoned since the unknown value may be any point between the Laspeyres (L) and Paasche (P) indexes. 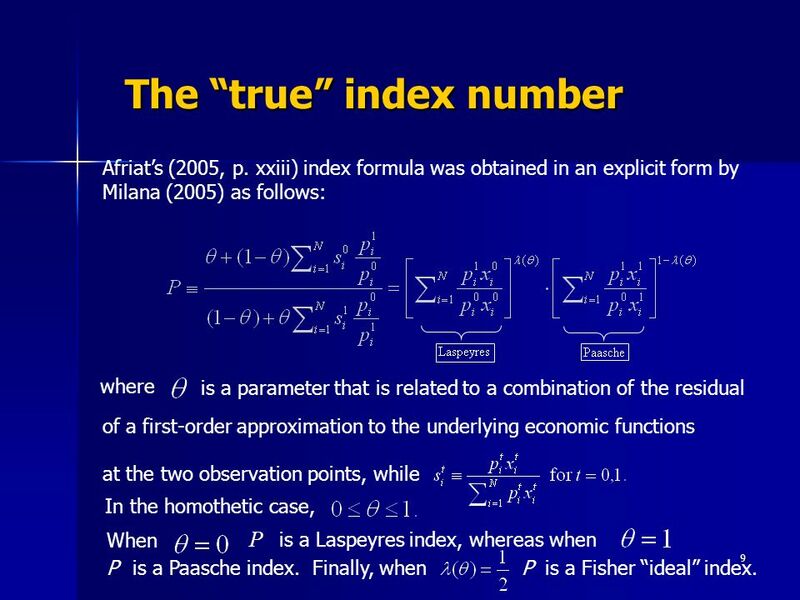 This conclusion was already reached by Afriat (1977, p. 112): Any ambiguity about true index […] shows no effect in the unambiguousAny ambiguity about true index […] shows no effect in the unambiguous result that the set of values is in any case identical with the Paasche-Laspeyres Interval. The true points are just the points in that interval and no others; and none is more true than another. There is no sense to a point in the interval being a better approximation to the true index than others. There is no proper distinction of constant utility indices, since all these points have that distinction. 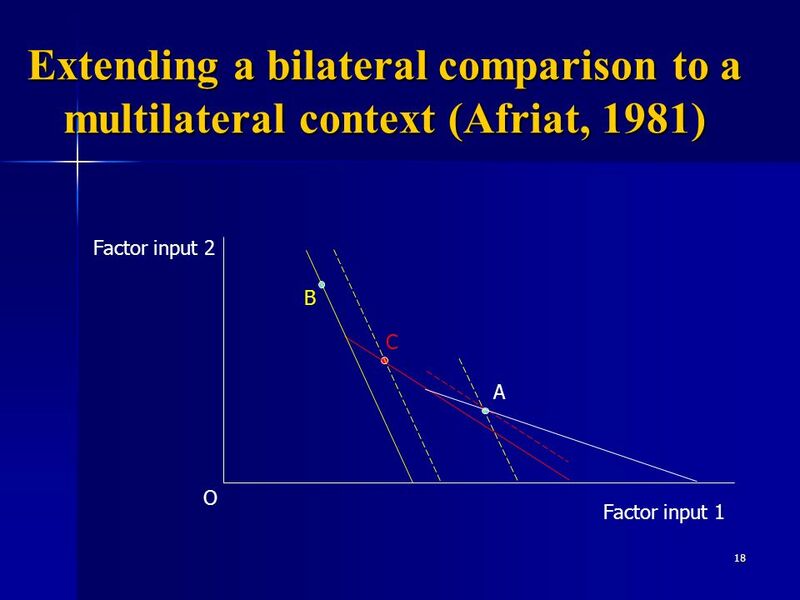 And, again, Afriat (2005, p. xxiii) states: Let us call the LP interval the closed interval with L and P as upper and lower limits, so the LP-inequality is the condition for this to be non-empty. While every true index is recognized to belong to this interval, it can still be asked what points in this interval are true? The answer is all of them, all equally true, no one more true than another. When I submitted this theorem to someone notorious in this subject area it was received with complete disbelief. Here is a formula to add to Fishers collection, a bit different from the others. Index Formula: Any point in the LP-interval, if any. 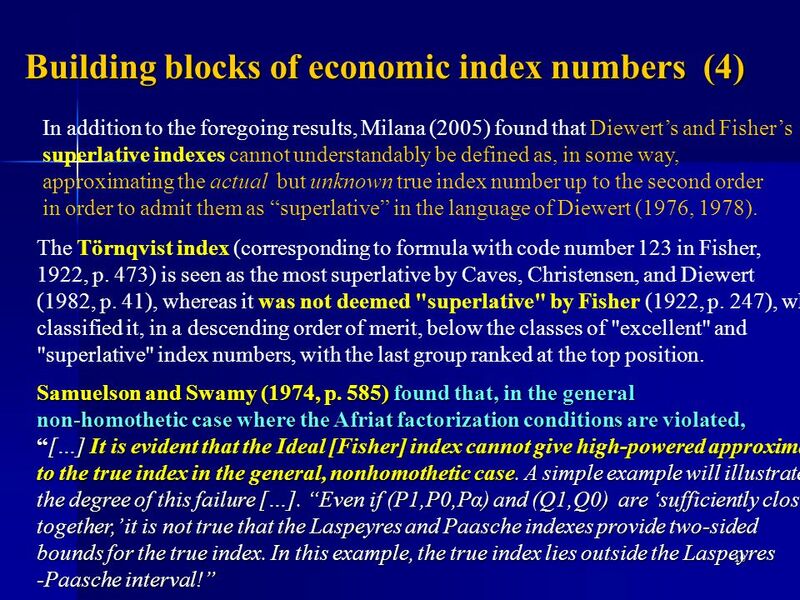 10 10 Building blocks of economic index numbers (4) The Törnqvist index (corresponding to formula with code number 123 in Fisher, 1922, p. 473) is seen as the most superlative by Caves, Christensen, and Diewert (1982, p. 41), whereas it was not deemed "superlative" by Fisher (1922, p. 247), who classified it, in a descending order of merit, below the classes of "excellent" and "superlative" index numbers, with the last group ranked at the top position. In addition to the foregoing results, Milana (2005) found that Diewerts and Fishers superlative indexes cannot understandably be defined as, in some way, approximating the actual but unknown true index number up to the second order in order to admit them as superlative in the language of Diewert (1976, 1978). Samuelson and Swamy (1974, p. 585) found that, in the general non-homothetic case where the Afriat factorization conditions are violated, […] It is evident that the Ideal [Fisher] index cannot give high-powered approximation[…] It is evident that the Ideal [Fisher] index cannot give high-powered approximation to the true index in the general, nonhomothetic case. A simple example will illustrate the degree of this failure […]. 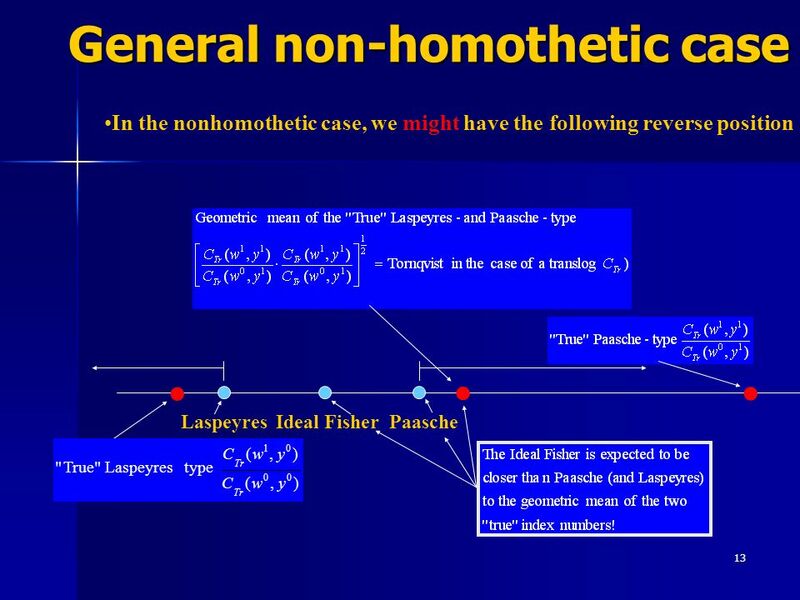 Even if (P1,P0,Pα) and (Q1,Q0) are sufficiently close together, it is not true that the Laspeyres and Paasche indexes provide two-sided bounds for the true index. In this example, the true index lies outside the Laspeyres -Paasche interval! 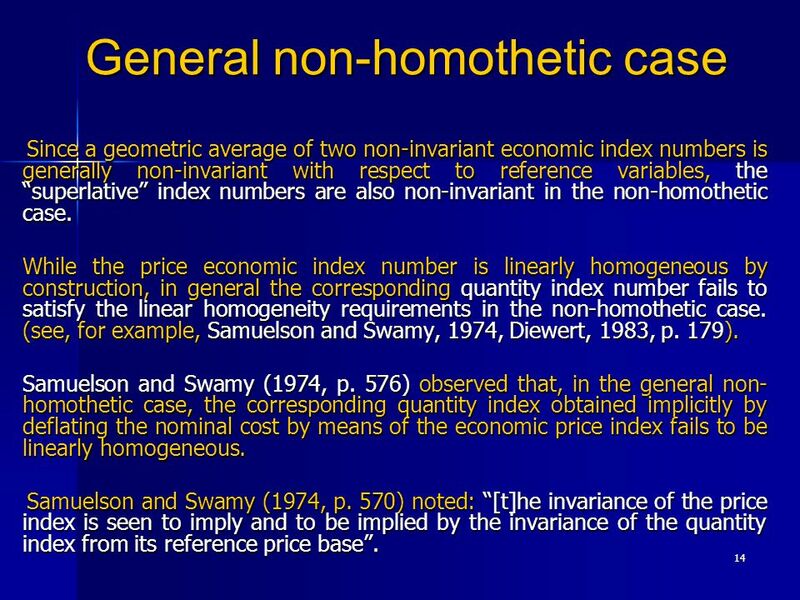 12 12 General non-homothetic case In the non-homothetic case economic index numbers are non-invariant (this is because it is not possible to disentangle univocally the mutual effects of variables) If we deflate a nominal value by means of a non-invariant price index number the resulting implicit quantity index is not in general homogeneous of degree 1 (if, for example, the elementary quantities double, in general the quantity index does not double). 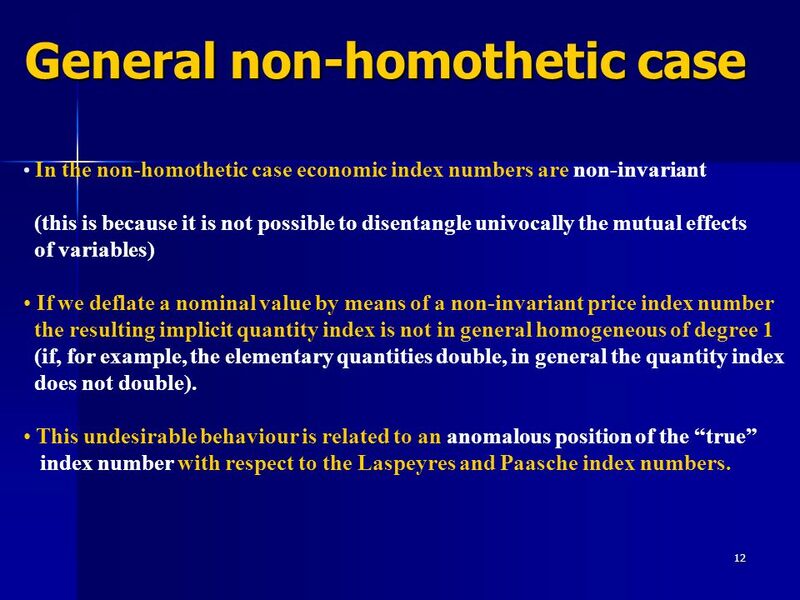 This undesirable behaviour is related to an anomalous position of the true index number with respect to the Laspeyres and Paasche index numbers. 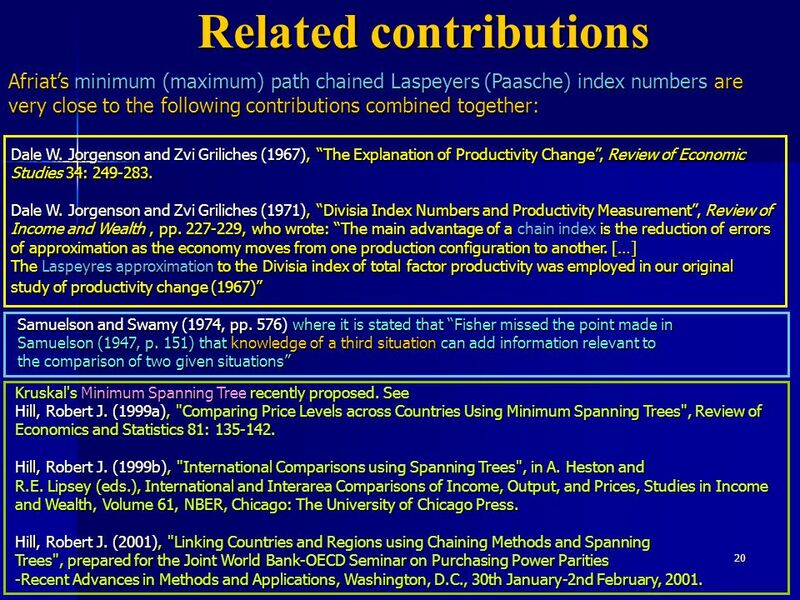 20 20 Related contributions Afriats minimum (maximum) path chained Laspeyers (Paasche) index numbers are very close to the following contributions combined together: Dale W. Jorgenson and Zvi Griliches (1967), The Explanation of Productivity Change, Review of Economic Studies 34: 249-283. Dale W. Jorgenson and Zvi Griliches (1971), Divisia Index Numbers and Productivity Measurement, Review of Income and Wealth, pp. 227-229, who wrote: The main advantage of a chain index is the reduction of errors of approximation as the economy moves from one production configuration to another. […] The Laspeyres approximation to the Divisia index of total factor productivity was employed in our original study of productivity change (1967) Samuelson and Swamy (1974, pp. 576) where it is stated that Fisher missed the point made in Samuelson (1947, p. 151) that knowledge of a third situation can add information relevant to the comparison of two given situations Kruskal's Minimum Spanning Tree recently proposed. See Hill, Robert J. (1999a), "Comparing Price Levels across Countries Using Minimum Spanning Trees", Review of Economics and Statistics 81: 135-142. Hill, Robert J. (1999b), "International Comparisons using Spanning Trees", in A. Heston and R.E. Lipsey (eds. ), International and Interarea Comparisons of Income, Output, and Prices, Studies in Income and Wealth, Volume 61, NBER, Chicago: The University of Chicago Press. Hill, Robert J. 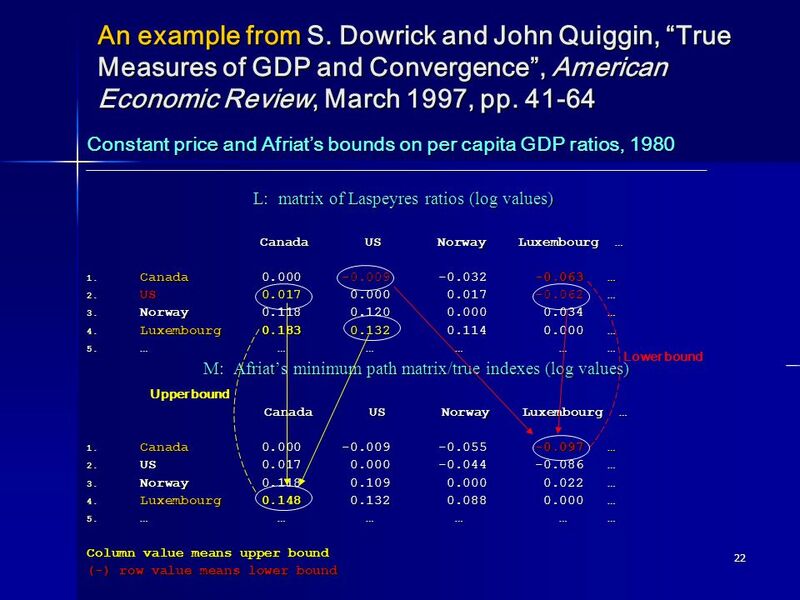 (2001), "Linking Countries and Regions using Chaining Methods and Spanning Trees", prepared for the Joint World Bank-OECD Seminar on Purchasing Power Parities -Recent Advances in Methods and Applications, Washington, D.C., 30th January-2nd February, 2001. 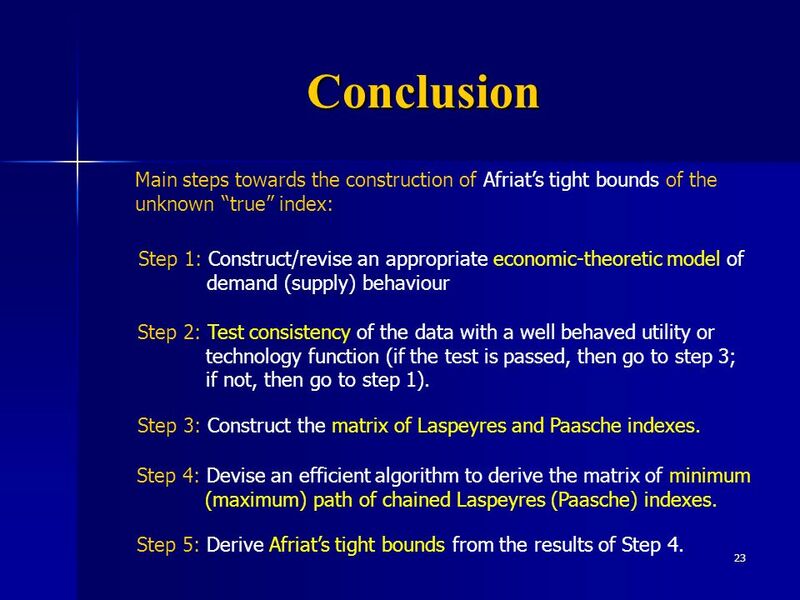 23 23 Conclusion Main steps towards the construction of Afriats tight bounds of the unknown true index: Step 2: Test consistency of the data with a well behaved utility or technology function (if the test is passed, then go to step 3; if not, then go to step 1). 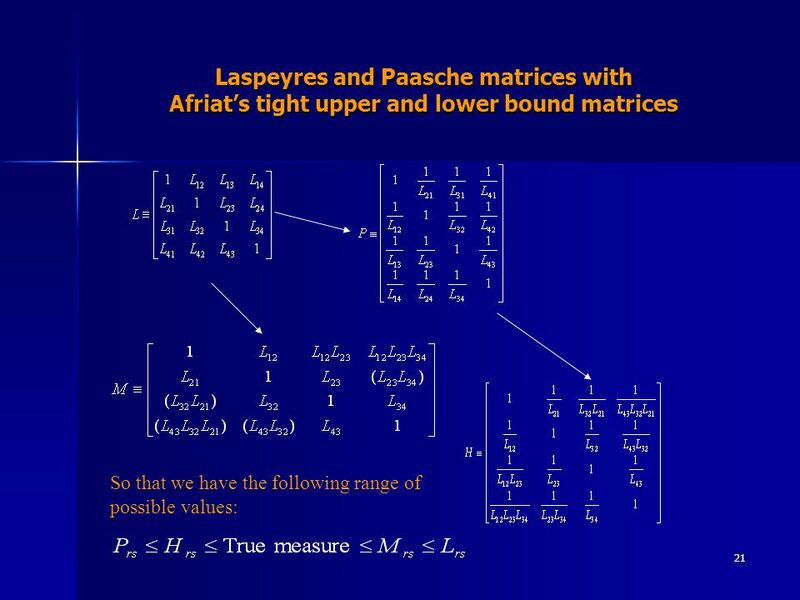 Step 3: Construct the matrix of Laspeyres and Paasche indexes. Step 4: Devise an efficient algorithm to derive the matrix of minimum (maximum) path of chained Laspeyres (Paasche) indexes. Step 1: Construct/revise an appropriate economic-theoretic model of demand (supply) behaviour Step 5: Derive Afriats tight bounds from the results of Step 4. 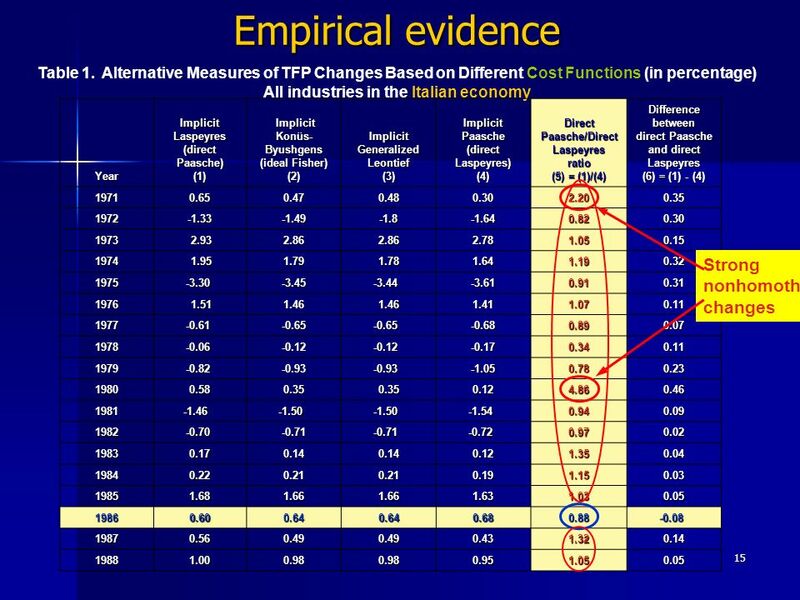 Download ppt "1 Alternative Measures of Productivity in a Changing Structure of Production by Carlo Milana Istituto di Studi e Analisi Economica, Rome, Italy This presentation."